Even if it's not actually Christmas time, this fun little family game is worth a look, but given its theme, it might be worth saving for the holiday season in order to appreciate it properly. 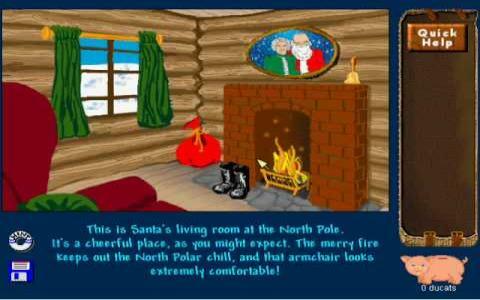 As you'd expect, it's a Christmassy game, so you get all the vibrant visuals necessary in such an experience plus a bunch of fun little puzzles and which combine to make it a little treat for the family to enjoy together. The player is thrown into the curly shoes of Fizbin, one of Santa' little elves who toils away in his workshop, churning out toys all year round. It's now your responsibility to protect Santa's sack, boots and bells ready for the big day but unfortunately, you've fallen asleep and then woken up only to discover that someone has stolen them. Now it's time to set out on an epic journey to get everything back so that Christmas isn't ruined for kids around the world. What all this translates into is a sort of lighthearted and fairly simple graphical adventure game where you navigate through a series of environments, collecting items and using them to solve a variety of puzzles. There's a nice mix of inventory-based head scratchers and logical brain teasers and while none of them are exactly Myst or Monkey Island calibre, they are certainly fun to solve and fairly satisfying too. The visuals are pretty decent for such a game, with all the expected bright colours needed for the target audience and you also have plenty of cheery holiday music to support the adventure. This certainly isn't a classic but it must be applauded for its non-violent approach and feel-goo factor so if you are looking for a cheery romp, this fits the bill.